Registration is now available for the 2019 Immersion Program. Immersion ’19 will be held at Loyola University Chicago, July 28-August 2, 2019. 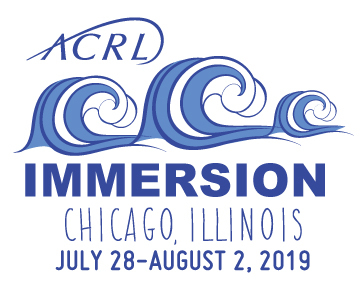 Immersion ’19 is an intensive 4 ½ day program designed for those who contribute to the educational role of libraries in higher education. Through a critical examination of information literacy, teaching and learning, and influence and leadership, the Immersion program curriculum aims to develop critically reflective practitioners who go on to enact change in their practice, projects, or personal and professional goals. The Immersion program is designed for participants with any level of experience in libraries. We invite anyone who would like to reflect upon, extend, and deepen their practice as an educator in libraries, regardless of particular job function or title, to co-create an engaged community of learners in partnership with the program facilitators. Examine the educational role of librarians in higher education in order to appraise their own position and context of practice, including their institutional setting and larger systems of power and privilege. Reflect on various conceptions of information literacy in order to develop and apply a personal and, when applicable, shared understanding of information literacy. Examine and question underlying assumptions about teaching and learning in order to develop critically informed instructional practices. Engage with theories of influence, change, and leadership in order to develop a critical perspective that addresses issues of power and privilege in higher education and fosters inclusive workplaces and communities. Registration materials are available online. Registration is capped at 100 participants and registrations are accepted on a first-come, first-served basis. Visit the Immersion website for complete details, including registration, housing, and scholarship materials. Contact mconahan@ala.org with questions.